lola's secret beauty blog: CYBER MONDAY DEALS GALORE! Aéropostale: Cyber Monday Sale up to 75% off EVERYTHING! Plus 25% Off your entire order. Amazon: Check the Today's Deals section for amazing savings. Lots of Cyber Monday deals– including Amazon devices starting at $24.99. If you have Amazon Prime, expect even better deals. Ann Taylor: Cyber Monday Exclusive Free Shipping PLUS 50% Off EVERYTHING! Use Code: BESTMONDAY. Ann Taylor Loft: Cyber Monday Exclusive Free Shipping PLUS 50% Off EVERYTHING! Password: CLICK. Banana Republic: Cyber Monday 50% off EVERYTHING. No exclusions! Online Only. Bandier: 20% off of EVERYTHING. Barneys New York: Sale Up to 40% Off Designer Collections. Barneys Warehouse: Take an EXTRA 50% Off of Clearance. Beautyhabit: 20% Off Today Only! Use Code: CYBER. Enjoy Complimentary USA Standard Ground Shipping with $75 + Purchase. Free Samples with Every Order! Check all of the gifts with purchase for the holidays. Bed, Bath & Beyond: Too many Cyber Monday Deals to list! Bloomingdale's: Cyber Monday: Take 25% off a large selection of items (11/27 Only). 10% Off Beauty Cyber Offer Online Only Beauty Offer! Take 10% off almost all beauty purchases (Valid 11/26-11/27). Chico's: Cyber Monday 50% OFF YOUR ENTIRE PURCHASE. Free Shipping on all orders. Passport members take an extra 5% off. Use Code: 35901. Cole Haan: Up to 50% Off Plus 10% off your purchase. Use Code: CYBER. Crate & Barrel: Cyber Monday: 15% Off a full price item Use Code: SAVE15. 40% Off of lots of furniture items. $150.00 OFF Select Vitamix Blenders. 30% Off 700+ holiday items (Through 11/27). Cult Beauty: Check out their website to see their Cyber Monday deals. Derma-E: 30%+ Off Everything Use Code: DERMA30BF (Ends 11/27 at 11:59PM). Dermstore: Cyber Weekend Sale Save up to 25% Use Code: WEEKEND (Ends 11/ 26 11:59PM). Skinmedica Sale 20% Off Use Code: SKINMED20 (Ends 11/30). Finish Line: 20% Off Online orders Use Code: CYBER20 (Exclusions apply). FOREO: Save up to 30% off on select items at FOREO.com! Use Code: VIBBLACKFRIDAY Offer is valid now through 11.29.17 Offer valid only for US customers. Gilt: Cyber Monday Take an Extra 20% Off. Use Code: CITYCYBER20. J.C. Penney: Online only: Extra 35% off $100 or more, now through 11/27. The challenge is on! Shop over 100,000 deals in store & online. Code: SHOPNOW8. Valid 11/25-11/27. J. Crew Factory: 50%-60% Off everything! (Some exclusions apply). An Extra 50% Off clearance Use Code: FRIYAY. Juice Beauty: Cyber Monday Enjoy 20% Off everything! Use Code: Cyber17. Exclusive Holiday Sets with serious discounts. Kate Spade: Check Sales on Monday morning to see if more has been added. Kate Somerville: 20% Off. Use Code: 20CYBER17. Plus complimentary FULL SIZE DermalQuench with your $150.00 purchase ($95.00 value). Holiday gift sets with deep discounts. 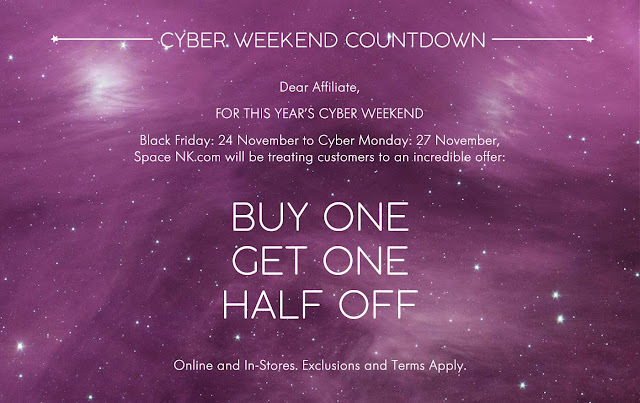 Kneipp: Cyber Monday: Starting on 11/27, the entire site will be 40% OFF + FREE Shipping! This is for a limited time only and the sale ends on 11/29. Lancôme: Receive 20% Off site wide Use Code: FRIENDS. Receive a 4-piece sample plus Free Shipping on your order of $49.00+ Receive a bonus sample with your order of $75.00+ Use Code: WINTER (Ends 11/30). Lands' End: Up to 60% Off Sale on 100s of styles. L'Occitane: Cyber Monday Sales galore. Take 20% Off full priced items. Take 25% Off ONLINE Purchases Use Code: CYBER25 (Ends 11/29). Amazing Holiday Gift Sets at discounted prices. Browse their special offers and exclusive beauty treat discounts. Lord & Taylor: Custom free 7-piece gift + receive your choice of 3 additional beauty essentials with a $70+ Lancôme Purchase. Up to $208 Value! (Ends 11/27). Check back for Cyber Monday Sales. Macy's: Take and Extra 20%. Extra 10% Off select departments (Exclusions apply. Use Code: CYBER. Free shipping with $25.00 purchase (excludes furniture and mattresses. Marc Jacobs Beauty: The Mystery Bags are back. Free Shipping on $50.00 orders. Check out their Sale section! MICHAEL KORS: Up to 50% Off all sale. NaturaBrasil: Cyber Monday: A free full-size product with $50 purchase + free shipping site wide. Neiman Marcus: Cyber Monday Beauty Gift. Free cloth filled with deluxe samples with a $225.00 beauty purchase Use Code: NMBEAUTY. Cyber Monday Funday. Earn up to a $750.00 Gift Card. NM Last Call: Cyber Monday. Take an Extra 40-80% Off EVERYTHING. Extra 60-80% Off Clearance. Free Shipping Use Code: CYBER. Nordstrom: Cyber Monday EXTRA 20% Off Select Sale items. Select your 10x Points Day! : Beauty Sales, Women's Sale, Men's Sale, Trend Sale, Kid's Sale & Home Sale! Nordstrom Rack: HUGE Savings sitewide. Take an extra 30% Off clearance for a total savings up to 75% Off. Paula's Choice: Each day of the week receive a different GWP with your purchase of $65.00 or more. Holiday Gift Kits at once-a-season prices. Receive 20% off site wide plus free shipping with any purchase Use Code: GIFT7. FREE Standard Shipping on All Orders applies to US and Canada only. Free Shipping does not apply to US Territories. Offer expires 11:59 pm PT, December 31st, 2017. 3 Free Samples With Purchase. Choose your 3 free sample packettes on orders of $5+ from available options at cart. Ralph Lauren: Take 30% off when you spend $100 or more with Use Code: THANKS. REN: 30% Off for Cyber Monday purchases. REVOLVE: Up to 65% Off Sale (No code necessary). Saks Fifth Avenue: Up to 40% Off designer selections. Earn up to a $750.00 Gift Card Use Code: CYBER17. Sephora: 12 Hours, 12 Deals: Get a new trial size sample every hour free with $20.00 purchase Use Code: CYBER. Lots of amazing Cyber Monday Specials. There are also lots of incredible Sale Items. Up to 50% Off. Shopbop: Check back for new sales. Shu Uemura: Cyber Monday Offer! Enjoy 50% off select items at Shu USA! No code required at checkout! Shop today while quantities last! (valid Nov 25- Nov 28). Enjoy Lighting Deals at Shu Uemura USA! New deals every 12 hours, do not miss out! Code changes every 12 hours! (valid 11/26-11/28). 5 Free Samples on orders of $50.00+ Use Code: LOLAXSHU (Ends 12/31). Skinstore: Cyber Weekend 20% off your purchase. Use Code: CYBER. Plus free beauty bag worth $150.00 when you spend $120.00. Amazing Gifts with Purchase just in time for holiday shopping. Sur La Table: Clearance up to 70% Off and so much more! Swell: Black Friday 30% Off Sitewide! Use Code: FRIDAYDEALS. Holiday Gift Sets for every price range now available. The Body Shop: 50% off MANY items. Free shipping with any purchase. Holiday Gift Sets galore. Lots of amazing deals coming! The Container Store: Check their special savings and sales. Ulta: Lots of AMAZING Cyber Monday Deals are coming including free shipping with any $35.00 purchase. Sales, Specials and Coupons. Urban Outfitters: $50.00 Off purchases of $150.00 or more. $15.00 Off Purchases of $75.00 or more. Violet Grey: Receive $15 off orders $100.00 or more. Receive $50.00 off orders of $250.00 or more. Receive $100.00 off orders of $500.00 or more. Receive $250 off orders of $1,000.00 or more. West Elm: Up to 60% Off markdowns. Williams Sonoma: HUGE Selection of Cyber Monday Deals!. Zadig & Voltaire Paris: 40% Off Select from Fall Collection.